Vaccination is one of the most convenient and safest preventive care measures available. Without immunizations, diseases we are now protected against could easily return. Immunization clinics at Mid-Michigan District Health Department provide vaccinations as recommended by the Centers for Disease Control (CDC) Advisory Committee for Immunization Practices (ACIP). Walk-ins will be accommodated as the schedule allows, but appointments are preferred. Don't let the cost of vaccines prevent you from getting vaccinated. MMDHD participates with Vaccines for Children (VFC) and Michigan Adult Vaccine Program (MI-AVP). Both programs offer free vaccines to those who qualify. MMDHD also bills most insurance companies to cover the cost of vaccinations. A small administration fee is charged for each vaccine, using a sliding fee scale based on your income. This fee may be waived if there is a financial hardship. To obtain a medical waiver, please make an appointment with your health care provider and have him/her complete this Medical Waiver Form. Want to see how your county's immunization rates compare to the rest of Michigan? check out these quarterly report cards. From birth to adulthood, vaccinations are important! Why Immunize According to the CDC? Where can I get the flu shot? Flu clinic information will be posted on this site. You may also call the branch office nearest you for dates and times of clinics in your area. Adverse events reported to providers after vaccination should be submitted to the Vaccine Adverse Events Reporting System (VAERS) according to state guidelines. For more information and reporting forms, please contact VAERS at (800) 822-7967 or visit the VAERS website . My child missed some of their shots. Do they need to start over? No. You can continue the series where you left off. Remember that delaying or refusing vaccines can put a child at risk for disease. Can my child get their shots if they have a cold or ear infection? Mild illness or fever is not a reason to delay immunizations. If you have questions, call and speak to the clinic nurse. Is it safe to get so many shots at once? Careful and thorough studies show that getting many vaccines on the same day does not decrease their effectiveness or increase side effects. What side effects will my child have when getting their shots? Most side effects are very mild and may include a slight fever, fussiness or some redness and soreness at the injection site. Why does my child need chicken pox vaccine? Isn't it better to get the disease? Chicken pox infection begins with fever and then a blistering rash breaks out. On average, people get 250-500 of these itchy blisters. Most people survive without any problems, but it can have complications such as pneumonia, brain or skin infections, and death. The vaccine has only minor side effects and is 95 percent effective. 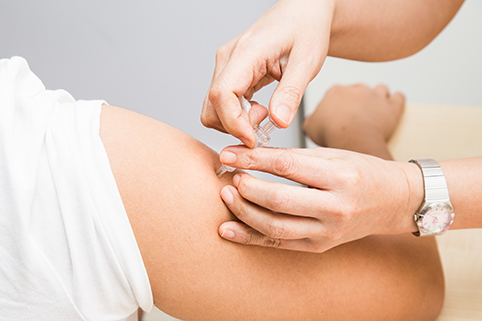 People who have had vaccine instead of disease are four to five times less likely to get shingles and if they do, it is a milder case without complications. What does VFC stand for and who is eligible for it? he/she is eligible for the VFC programs with the exception that he/she has private health insurance, including MI-Child or any commercially purchased managed health care plan, with immunization coverage. Definition for Under-Insured: For the purposes of determining eligibility for VFC, children are considered to be under-insured if the child's insurance does not cover any reimbursement for the cost of the vaccinations. A child with health insurance that has no immunization coverage at the time the child presents is considered to be under-insured and eligible to receive VFC vaccine. The Michigan Care Improvement Registry (MCIR) is a lifespan registry including citizens of all ages in the MCIR. MCIR benefits health care organizations, schools, licensed childcare programs, pharmacies and Michigan’s citizens by consolidating immunization information from multiple providers into a comprehensive immunization record. This consolidation reduces vaccine-preventable diseases and over-vaccination, allowing providers to view up-to-date patient immunization history in one system. The Mid-Michigan District Health Department was formed in 1966 and serves Clinton, Gratiot and Montcalm counties. Our mission is to take action to protect, maintain and improve the health of the communities we serve. Our vision is to continue advancing with innovative solutions to achieve healthier outcomes. Monday-Friday: 8:00 a.m. to 4:30 p.m.
Closed for lunch 12:00 to 12:30 p.m.